A letter of condolence may be one of the most difficult things you'll have to write as they're the result of a time of sadness and often reflection. 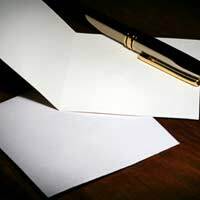 The most common reason for writing a letter of condolence occurs when someone you know has lost a loved one and you wish to express your sorrow for their loss and to offer them some support and words of comfort. However, they are not specifically to mark someone's death. You may also feel the need to write a letter of condolence when somebody's suffering after a divorce or if there has been a serious accident or injury or they can be even be written to people who may have been made redundant or failed an important exam etc. However, for the purpose of this article, here is an example of an appropriate letter to somebody who has lost a loved one. The letter expresses sympathy at the person's loss and the thoughts for those who have been left behind as well as taking some time to reflect upon the good times spent with the person who has died and memories of them and affection for them. Here is an example of a letter of condolence. I was deeply saddened to hear about the loss of Eric after his long struggle with cancer. It was only last week when I was at the bowling club that Tommy Allan was asking me how Eric was doing and we were having a laugh and a joke about the time we all went to Blackpool and Eric fell off that donkey and got covered in wet sand. We had some great weekends away together didn't we, and Eric was always the life and soul of the party. I'll also remember the time when Bill was made redundant and Eric went to great lengths and showed great kindness in finding him the job in the factory which Bill was very grateful for. I know it has been a difficult time for you too over recent months. We all know how proudly independent Eric was and we know just how much love, devotion and total commitment you put into caring for him during his illness, especially when he was no longer able to spend time in the garden and in his beloved greenhouse. I hope you will take great comfort over the next few weeks and months in knowing that Eric is now free from any further pain and suffering. He will be looking down upon you with great love and affection and giving you the strength to put all the recent months of sadness behind you and the encouragement to look forward to happier times ahead. Sending sympathy cards with condolence words and flowers to someone you know who passes away, keep it short and share some sweet stories about the person who died. Let the bereaved know that you are thinking about him and maybe offer to listen if he needs to talk. When my sister's boyfriend died, I hug her and let her cry as much as she needs to release her pains.